Bar None Produce update. Last Friday night at Gifford Park market and early Saturday morning in Fremont. Always good to see my buddy Jeff Jacob. Free Range, Farm Fresh eggs are $5/dozen and we’re on our way to twice that number a day from the happy and generous hens. I’ve harvested and sold out of five successive plantings of beets, the sixth in the ground for my cellar. Same with carrots. Pulled 350 onions, selling only half, the rest destined for braids and rafters. Same for all 150 garlics. Harvested nearly 500 blackberries, now finished for the season. Strawberries in three varieties (early, mid, late) trying hard to match those numbers. Red, Yellow, and White Raspberries all just now producing. Grapes heavy on the two vines we started in ’13. Pumpkins and butternut squash seemingly suspended in mid air along the fence line. Did my first real picking of tomatoes on Friday. 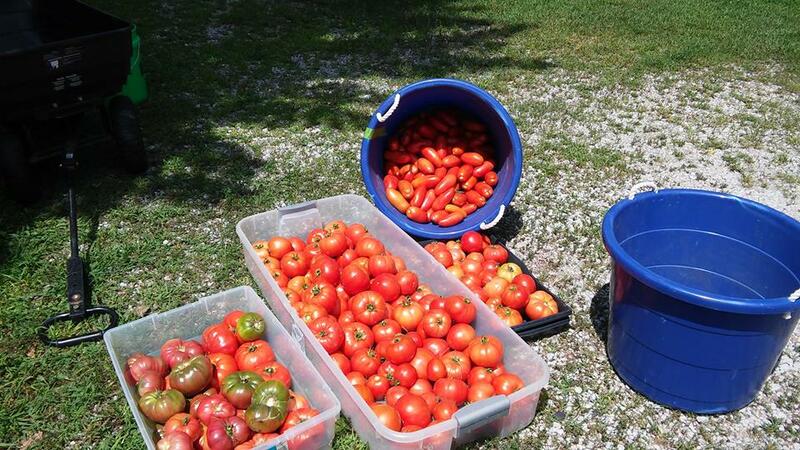 Close to 200 of the meatiest San Marzanos and another 100 beautiful slicers and heirlooms. I had to stop picking in order to make Gifford Park in time. 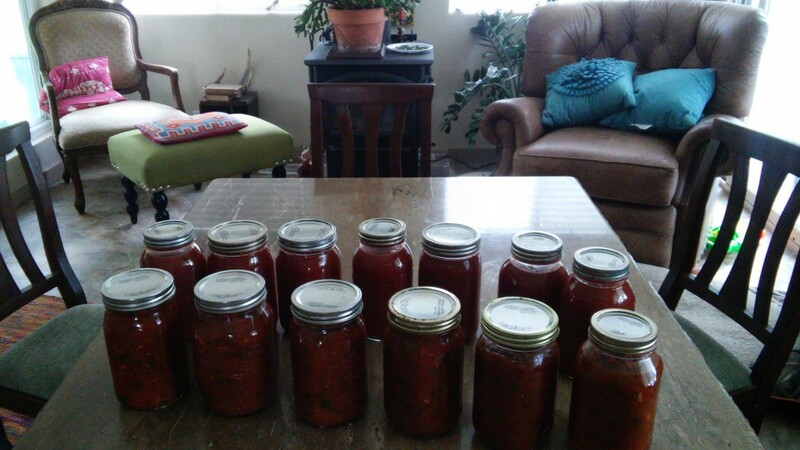 Picked another 100 San Marzanos and canned 6 quarts of Arrabiata Sauce on Sunday. And 7 quarts of spicy tomatoe juice. Shelled 3 pounds of dried Tongue of Fire shell beans. Made a large batch of kale chips. 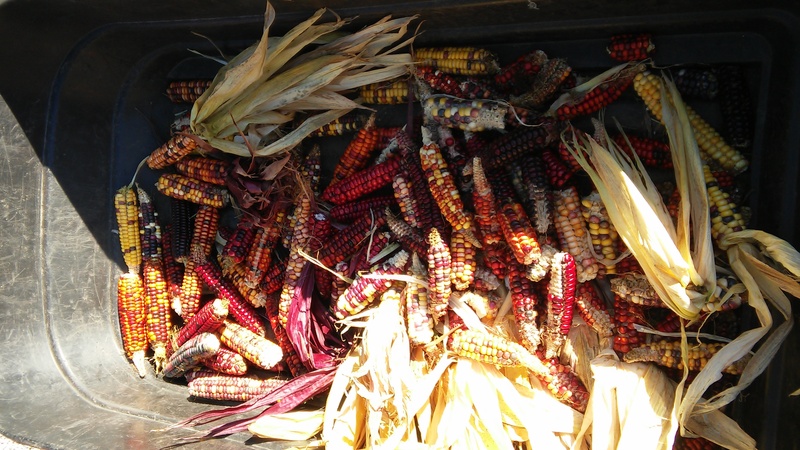 Harvested my small patch of Painted Mountain corn, that’s headed for the grindstone and winter larders. 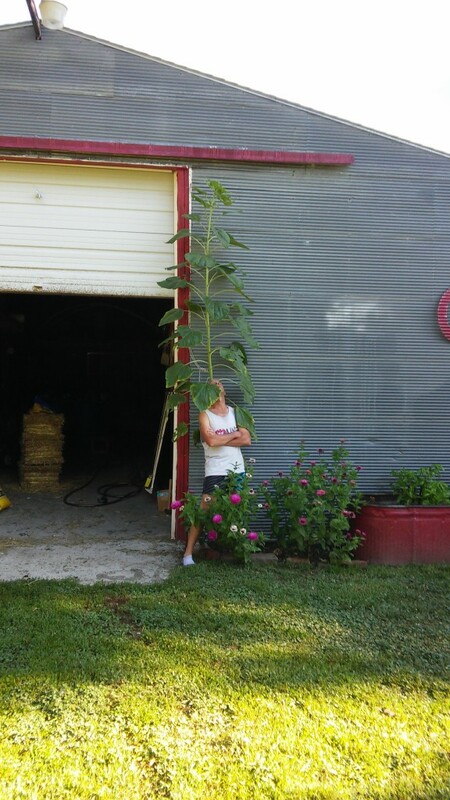 Also taking the time to grow the tallest sunflower you’ve ever seen. 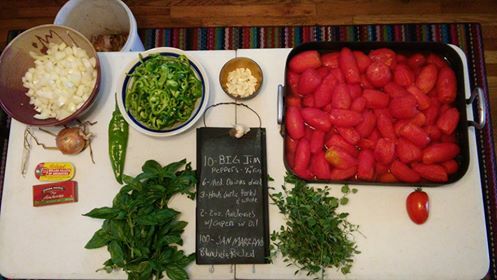 I ran out of time before I ran out of tomatoes on Friday. We sold out. Six quarts sauce and seven quarts juice the result of my Saturday afternoon pick. Always have to keep the winter months in mind. The anchovies didn’t germinate this year but everything else slept at the Bar None the night before. The corn is colorful and contains no genetically modified agents. I planted 150 sweet corn on June 29 that is now up to my eyes, ready for a Labor Day harvest. 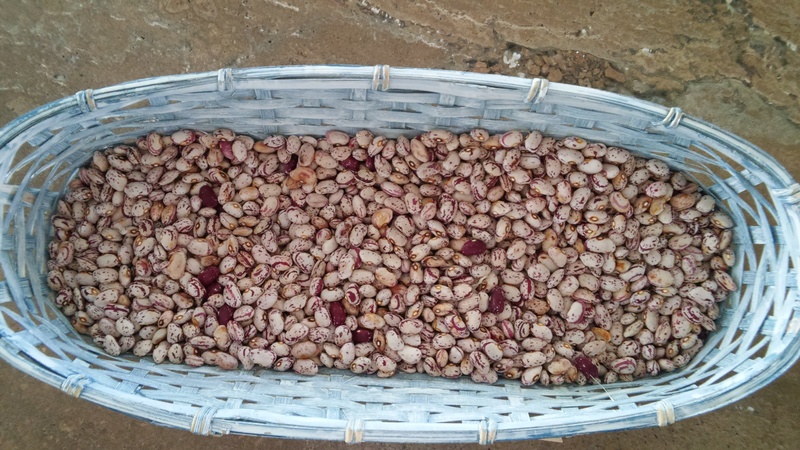 Tongue of Fire (Lengua de Fuego) beans also colorful with cranberry to dark red mottling. Perfect in the dutch oven atop a cold evening’s wood burning stove. This entry was posted in Uncategorized on August 11, 2015 by runguru.